Download: Thurston Moore's Beautiful 'Benediction' A glorious bit of Velvet Underground-esque balladry, "Benediction" moves elegantly through five minutes of subtle, gentle grace, propelled sure-handedly by Samara Lubelski's exquisite violin. 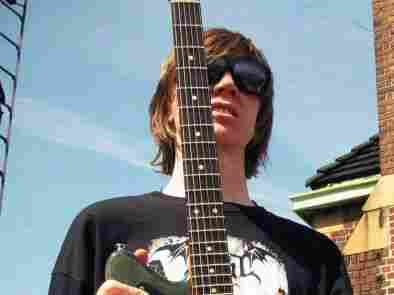 Thurston Moore has nothing to prove. At this point, his band Sonic Youth is three decades into the career Kurt Cobain coveted at Nirvana's peak: a just-right mixture of experimentation, success and artistic freedom. Moore is married to his bandmate Kim Gordon, with whom he makes everything from off-kilter pop songs to jagged noise freak-outs, and he gets to make the occasional solo record, on which he can indulge or rein in his impulses at will. Which means, of course, that Moore is both unmistakably cool and liberated never to care about any such signifier: He could release a symphony, an hour of free-form noise terror or a collection of Neil Sedaka covers, and he'd still get to make more records. It shouldn't come as a surprise, then, that he's so free to make sincerely beautiful music on a forthcoming solo album produced by Beck — another iconoclast who likes to take hairpin turns now and then. A glorious bit of Velvet Underground-esque balladry, "Benediction" moves elegantly through five minutes of subtle, gentle grace, propelled sure-handedly by Samara Lubelski's exquisite violin. As its title suggests, the song addresses the way lovers plea for security and constancy from each other; for a connection that can never succumb to betrayal or loss. "Benediction" unfolds like a prayer, but when Moore sings, "I know better than to let her go," he knows he can only speak for what he can control.